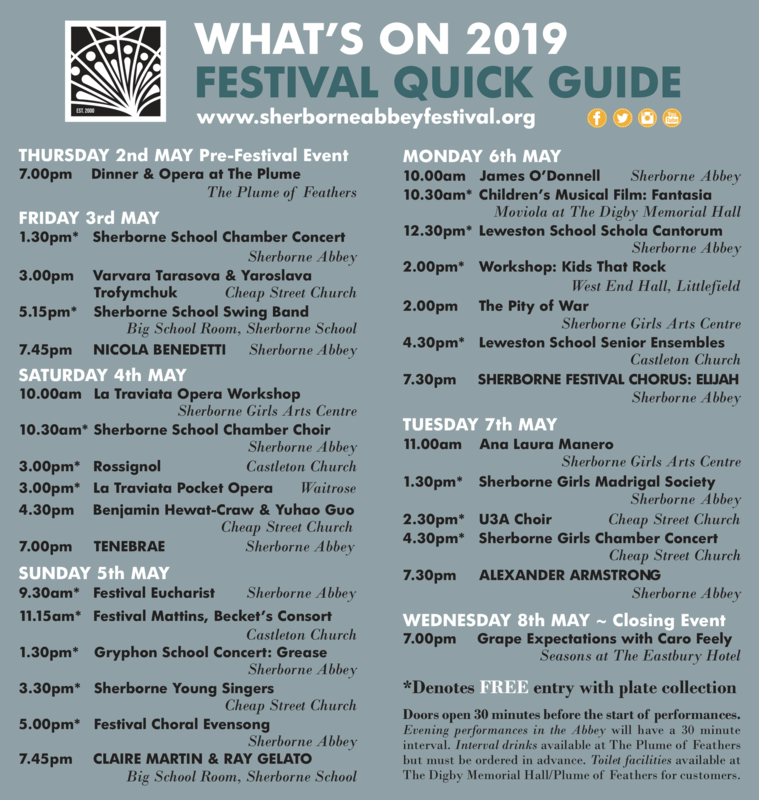 We are delighted to share preview news of award-winning Sherborne Abbey Festival’s celebratory 20th Season, taking place this year from 3rd-7th May at venues including Sherborne Abbey, Castleton Church, Cheap Street Church, Sherborne BSR, Digby Memorial Hall, West End Hall and Sherborne Girls NEW Concert Hall. You might have noticed our wonderful new logo? 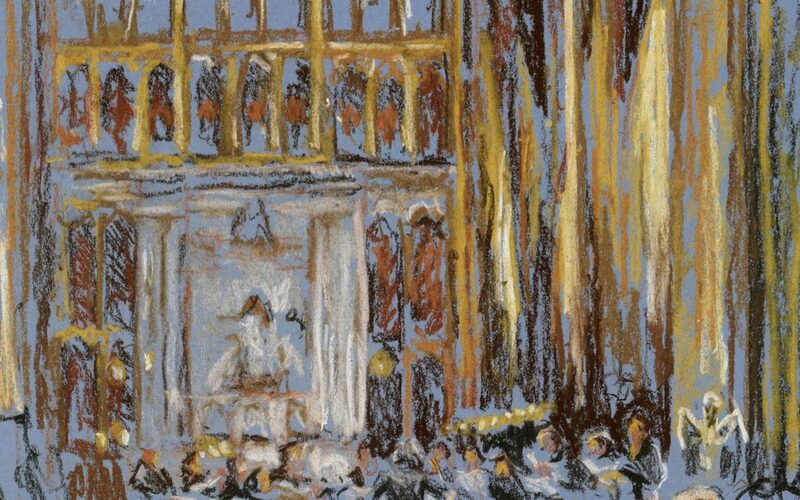 We have been inspired by the famous vaulted ceiling of Sherborne Abbey to launch a contemporary new look for the Festival in this very special anniversary year. We have also introduced two new diary dates either side of the Festival: A pre-Festival Opera Dinner, in association with Dorset Opera Festival, at The Plume of Feathers on 2nd May, and a closing event on 8th May at The Eastbury Hotel – with a unique opportunity to meet Caro Feely, biodynamic and organic wine grower from France, and enjoy a delicious wine pairing dinner with French café-style musical entertainment. As part of our continued outreach to the community, we are pleased to announce two new initiatives, especially for children, taking place on Monday 6th May. A relaxed screening of Fantasia, Disney’s 1940 animation set to classical music, at the Digby Memorial Hall with Moviola, and a Guitar Workshop for ‘Kids That Rock’ at The West End Hall in Littlefield promises bank holiday fun for young people. These stellar performers are joined by other hugely talented musicians and singers throughout the Festival – including, to name but a few, organist James O’Donnell (Director of Music at Westminster Abbey), baritone Benjamin Hewat-Craw and pianist Varvara Tarasova. We also welcome a group from Dorset Opera Festival to run our popular Saturday morning workshop and then perform a Festival first with an outdoor ‘Pocket Performance’ of La Traviata, in association with Waitrose. Liturgical elements of the Festival, always a very important part of the event, include a new anthem, commissioned especially for our anniversary from locally-born composer David Bednall, which will be played by David for the first time at the Abbey’s Choral Evensong on Sunday 5th May. As always, local young musicians, bands and singers have a major role with jazz, close harmony and barbershop, madrigal, choral and chamber ensembles from Sherborne School, Sherborne Girls, Leweston and The Gryphon School.